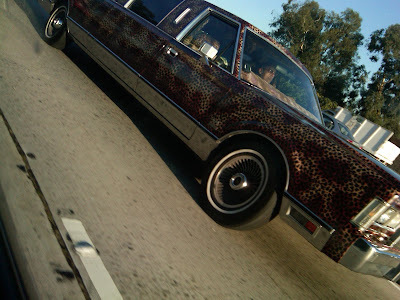 We heart the newest, most fabulous way to ride in style down the Sunset Strip: Leopard Limousines. Leopard Limousine has six in their fleet, and because times are tough, they’re on sale. “We normally charge $150 and hour,” says Marvin, “but for the depression we’ve lowered the rate to $75 an hour.” Who doesn't heart a 50% discount? The only thing more fabulous than the limos themselves, MIGHT be the lady who came up with this idea, Yvonne Weisengrund, Marvin’s wife. She looooves leopards. The proof? Check out this LL commercial Meow!